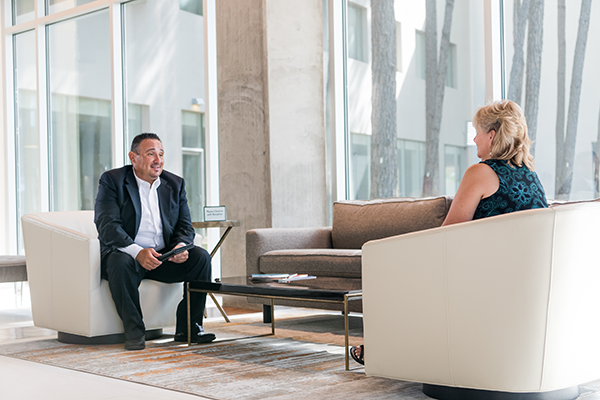 In property management, the goal is to make all tenants happy. Unfortunately, this can't always be the case. Learn what you can do to prevent running into this as well as how to mitigate the situation if it does occur in order to keep you and your tenants safe. Landlords and property managers deal with all types of tenants, but perhaps the most dreaded are the ones who exhibit unpredictable or violent behavior. Hostile tenants often resort to intimidation, harassment or threats to get what they want, which could be almost anything: lack of payment of rent, faking an accident to bring a false claim, violating the lease or getting back a security deposit. Don’t fight back or respond to threats with more threats. Respond professionally. Make it clear that you will not tolerate verbal or physical abuse or violence, and that any illegal action or inappropriate behavior could land the tenant or visitor in jail or in court. Ask someone to be with you in the office during any interaction with a tenant. They can act as a witness in the event that tensions do arise. Each state and city have very specific laws and regulations about conduct in a landlord-tenant relationship. Visit your state’s Department of Housing website for more information. From these laws, develop a “policies and procedures” list, and have an attorney review it. Be sure that all tenants are aware of and can access this list. Stick to a policy of written communication. Tell your tenants that all grievances, complaints and problems must be sent in writing. Barging into the office is not an option. All texts, emails, voicemails and written notes may help you if legal action arises. Be very clear about your lease. Don’t leave anything to chance or to be easily challenged. Clearly review all the rules and regulations of the lease with the tenant. Make sure they understand the procedures for tenant complaints, landlord meetings, conflict resolution, how and when rent should be paid, and tenant/landlord responsibilities and obligations. Leave no gray areas. Call the police if you suspect illegal activity. Don’t try to uncover the crime or confront the situation yourself. Keep in mind that a tenant’s arrest does not forfeit the tenant’s right to occupy the property. Conditions such as arrest or incarceration should be stated in the lease, along with next steps. Review these procedures with an attorney. Make sure your insurance covers situations like this. Not only can an out-of-control tenant make others feel unsafe, they can also cause serious damage to you or your property. Find a landlord insurance policy that includes legal fees, emergency assistance, accident damage and contents insurance. Rely on tenant screenings and references. Although no procedure can absolutely guarantee your safety, a tenant screening including asking for references could help. This goes beyond the usual credit report and criminal history -- it may also reveal a history of mental illness, odd behavior or violence. Ensure that all references are legitimate and verifiable. Follow the law when evicting a tenant. Remember that eviction rules vary from state to state, and sometimes even from city to city. These rules are put into place so that evictions cannot happen on a whim, as revenge or as a preventative measure. An eviction can only happen as a result of due process, with a court order. Check your local laws. Find a self-defense class in your area (try your local gym or community center). However, if a situation escalates with a tenant, you should do everything that you can to get out of trouble peacefully and civilly rather than to provoke a fight. Install an emergency communications system. An emergency help phone can save lives and prevent crime by contacting authorities faster than a phone app or smartphone. An emergency phone is programmed to directly access help without the risk of bad reception or a dropped call. Professionals can also provide medical help until medics arrive, helping to save lives and alleviate panic. Make sure that your tenants know where all emergency phones on the property are located and are aware of the benefits associated with using one, perhaps by providing signage in the lobby and/or regular tenant updates via an internal email newsletter. It’s often easy for trouble to look for and find a property manager. Taking precautions can make all the difference. Follow these steps and protect yourself, your staff, your tenants and your property. Always remember that emergency communications are also for the benefit and safety of property managers too. 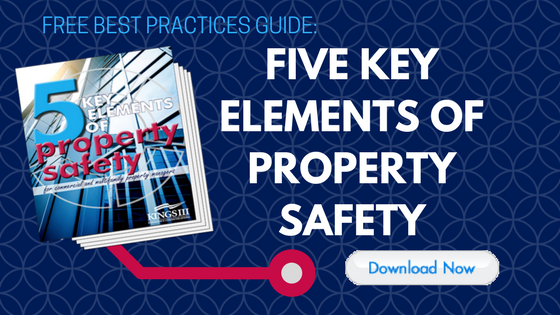 Learn more on-the-job safety tips for the property manager. To learn more about how Kings III can increase the safety at your properties, visit www.kingsiii.com.